mAterla encha ullar? saukhya ate? ini nama tuluTu bahuvachana padoklen encha malpunu’nd teriyonuga. 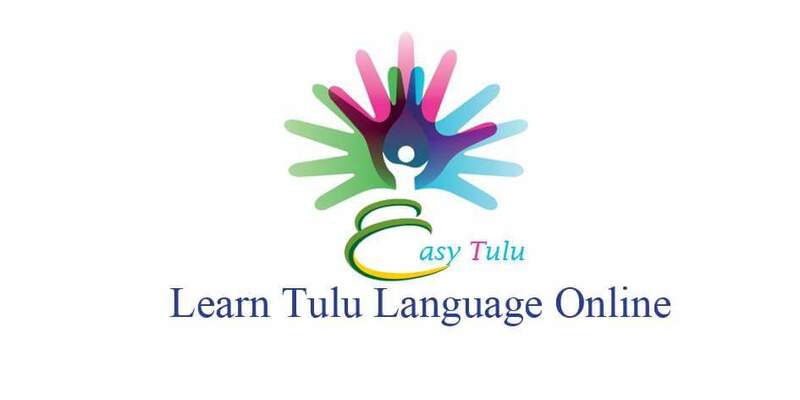 Today let us learn how to make plural nouns in Tulu. If you remember, we have already learned plural suffixes in Tulu in the first lesson. Today let us learn more about each suffix in detail. Alright! Now let me explain how and when to use each suffix. We will first go with ‘allu’ since it is the easiest one. This suffix is only used to make the nouns of relationship plural. This suffix is mainly used with nouns of relationship and human names to give respect. Also, it is used with ‘a’ ending human nouns to make them plural or to give respect to a single person. This form is used for both making plural nouns and giving respect when speaking about a single person. However, sometimes the nouns like ‘dEver’ is used as a singular noun with respect and can be pluralized by adding an additional ‘lu’ suffix (dEverlu). This suffix is mainly used with non-human nouns to make them plural. Also, it is used with human nouns which do not end in ‘a’ sound to make them plural or to give respect to a single person. You may think what is the difference between suffixe ‘lu’ and ‘kulu’? Why some nouns take ‘lu’ suffix and some take ‘kulu’? Why the plural form of ‘pili’ is ‘pilikulu’, but the plural form of ‘petta’ is ‘pettalu’ and not ‘pattakulu’? If you remember TuluLesson 3: Simple Present Tense, you know there are two types of conjugations in Simple Present Tense depending on the ‘matras’ (meters), a root verb takes to pronounce. The same rule applies here. If a noun takes 2 ‘matras’ to pronounce, then the suffix ‘kulu’ is used to make them plural. If a noun takes more than 2 ‘matras’ to pronounce, then the suffix ‘lu’ is used. Native Tulu speakers can use these suffixes appropriately without knowing about this rule. However, some may do mistakes when they come across some rarely used nouns or new nouns. 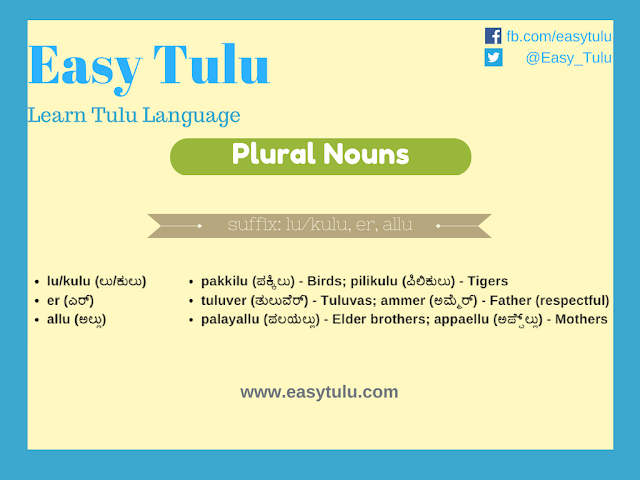 Knowing this rule may help new learners to avoid mistakes when using plural forms in Tulu. That’s all we had today. To avoid any confusion, here is the summary of today’s lesson. Appae = Appaellu or Appallu? Fruits = ಫಲಕುಲು or ಫಲೊಕ್ಕುಲು or ಫಲೊಕುಲು? All the three can be used. Hi kiran can u tell me meaning of few words. I tried to search for these words and sentenses but i didnt get anywhere. So i am asking you. Pls help sir. Kappal murkudunde arna? gadda kai didu kulder - Has his ship sunk? He sat putting his hand on the cheek. Cute tojuvolu - She is looking cute. I will follow you sir as I am intrested in learning tulu language. And thanks alot for your efforts.